Sightseeing pleasure cruise boats, lunch and dinner cruises, and passenger ferries sail on Lake Geneva with frequent departures from Genève, Lausanne, Montreux, Evian, Nyon and smaller towns. Lake Geneva (Lac Léman) is the largest lake in Switzerland and France. As one of the largest bodies of freshwater in Europe, boating is not surprisingly popular. Pleasure cruises is a well-established tourist activity on Lake Geneva with many boats dating from the pre-First World War Belle Epoque era. Passenger ferries provide important public transportation links between French and Swiss towns such as Lausanne-Evian and Nyon-Yvoire while small waterbus services connect parts of Geneva city. Recreational boating is also possible with rental boats and equipment available in most large towns. 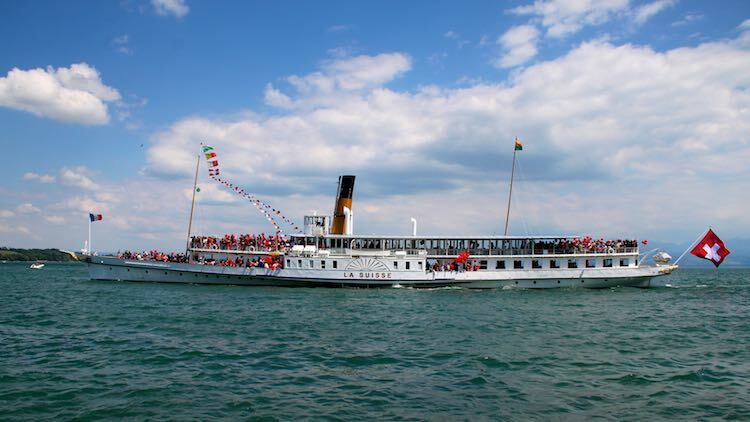 Tourists have been enjoying pleasure cruises on Lake Geneva for well over a century. Many of the day cruise boats on Lac Léman are Belle Époque paddle steamers in a two class configuration. The “Montreux” (built 1904) is the oldest boat in regular operation while the elegant La Suisse (1910) is the grande dame of the CGN fleet. The Compagnie Générale de Navigation sure le Lac Léman, better known by the acronym CGN, has the monopoly on most boat transportation links on Lake Geneva. In Geneva and some other towns cruises on further operators are possible but only CGN boats can drop passengers off at a port other than the original departure point. Best Lake Geneva Cruise – The best scenery for Lake Geneva cruises is between Lausanne and Montreux where the Alps form a constant backdrop and the vineyards of the Lavaux can be seen on the northern shores. CGN’s major ports of departure are Genève and Lausanne-Ouchy but boats often stop in smaller towns, especially on the Swiss northern shore of Lake Geneva. Regular boat cruises sail from mid-April to mid-October. The largest number of departures is in summer (mid-June to mid-September). During the shoulder seasons – spring (mid-April to mid-June) and autumn (mid-September to mid-October) lake cruises are available daily but with a much busier schedule on weekends. During winter, apart from the ferries, regular cruises are available mostly on Sundays only and for fondue dinner cruises on Thursday and Friday evenings. A cruise from Geneva to Lausanne takes over three hours while Lausanne to Montreux on the slow boat is around two hours. The number of stops is the main determining factor in the time required between ports. Using the train one way can be much faster if time is limited. Special daily card tickets allow for unlimited CGN boat travel on a day while almost all Swiss Railway passes and discount tickets are valid including the Junior Card and the Half-Fare Card. See also Savings Deals on Lake Geneva Cruises for more details on how to buy cheaper tickets for boat excursions. Passenger ferries operate year round on Lac Léman between Swiss and French towns. These passenger ferries are an integral part of public transportation in the Lake Geneva region. No car ferries operate on Lake Geneva. Passenger ferries are often the best way to travel to these French towns as regular train and bus services on the southern French side of Lac Léman are limited. The passenger ferries are also the only way to cruise on Lake Geneva on most days during the winter season. See also Passenger Ferries on Lake Geneva for more details on these boats, which are operate by CGN as CGNMobilité. The cheapest way to cruise on Lake Geneva is to use the mouette waterbuses (Mouettes Genevoises) in Geneva city. The Mouettes operate on four routes between Geneva’s left and right bank. Crossing the lake here takes only a few minutes. The Mouettes are part of Geneva’s public transportation network and all regular tickets, including Tout Genève and day passes are valid. Recreational boating is also very popular on Lake Geneva. Boats – including power boats, yachts, kayaks, windsurfers, and pedalo pedal boats can be rented in many large towns including Lausanne-Ouchy and Nyon.